You’ve been on a bit of a home improvement binge lately, since you finally went through a complete New Year’s storage unit clean out. Now, you’re turning your sites to that old shed in your yard because you want to make it into a useful space. But, you aren’t sure what to transform it from to so it does get plenty of use. Currently, it’s chock-full of stuff you rarely use (if it all) and it’s just taking up space in your yard. But, it can provide new use with a fresh shed conversion. 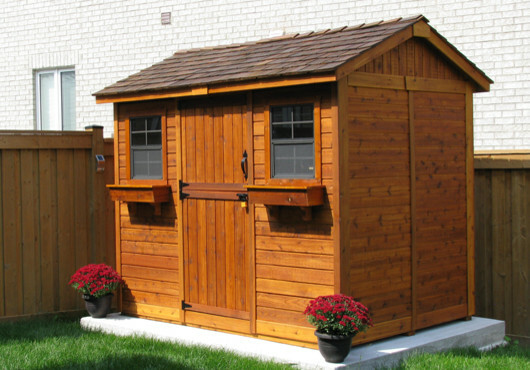 Shed conversions aren’t new but their popularity is certainly gaining momentum. From small apartment like retreats, to art studios, workshops, pool cabanas, and more, a shed can be made into just about any type of living space. The only real restrictions are your imagination. Some homeowners even go the extra mile, combining two sheds into one. By joining the two structures together, they enjoy a lot more space to work with, as well as more potential. Workshop. Let’s start with the most obvious shed conversion — a storage shed to workshop conversion. It’s something that doesn’t take a lot of skill and one that’s very budget friendly. Just empty it out, give a good cleaning, add some shelving and table space, hang and store tools, add lighting and ventilation, and you’re ready to go. If you want it to be more comfortable, insulate it and equip it with heat and air. Guest room. Here’s one shed conversion idea that truly transforms the space into a wonderful living space and that’s a guest room (if there’s sufficient room). By stripping it down, installing wiring, plumbing, insulation, walls, and drywall, you’ll have a blank slate to turn into a guest room. A small shower with a kitchenette, bed, and some sparse furniture will do the trick nicely and serve as a cozy guest room. Home office. If you don’t have enough room in your house for a home office, you might consider transforming your shed into an office. Here again, you’ll need wiring and climatization, and you’re on your way to having a great home office space that doesn’t take away a room in your house. If you are considering a shed conversion and need junk hauling for all the stuff that’s stuffed inside, just phone 800-433-1094 or visit Junk Garbage Removal. We also provide shed removal if you are replacing yours with another.